Lose yourself in the unique surroundings of Timanfaya National Park, a natural park on Lanzarote in Spain's Canary Islands. Enjoy a full-day tour through the other-worldly landscape created by volcanic eruptions over the generations; barren and rich all at once. Head out and make your way through the cubed white houses of the quiet Village of Uga. Travelling into the Fire Mountains, you'll stop for a photo opportunity in the impressive rolling hills and if you desire, hop on the back of a camel for a ride (not included in the price) amongst the pretty peaks. 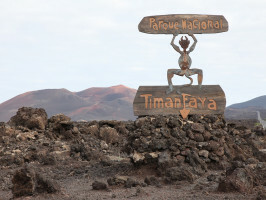 Get back on the road, pass more volcanoes, and drive into the splendour of the Timanfaya National Park. 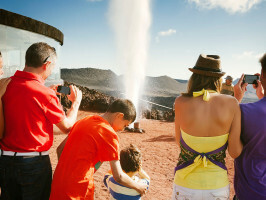 Enjoy geothermic demonstrations in the Hilario’s Plateau, and listen to entertaining stories of the many past eruptions in Lanzarote as you follow the rustic red and sprawling rocky terrain of the “Volcano Route”. 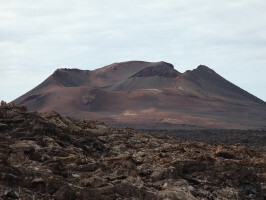 Continuing on to the southern part of the island, admire the “Lava Coast”, including a fascinating panoramic view of the El Janubio salt mines, employing many Lanzarote inhabitants throughout history. 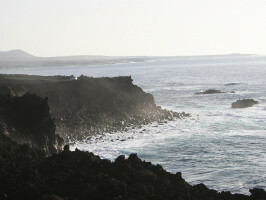 View the cliffs of “Los Hervideros”, great rocky shorelines created by sea and wind erosion. Dine on a delicious lunch in Yaiza, an award-winning town with remarkable beauty and seamless integration with its natural surroundings. Afterwards, cross La Geria, the most important vine-growing area of Lanzarote, where you'll stop at a winery and taste the local wares. 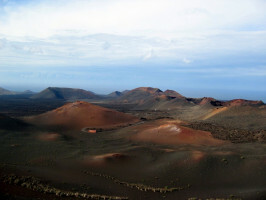 A wonderful opportunity to surround yourself in beautiful nature; come spend the day in Timanfaya National Park. Tuesdays: Spanish, English, German and Dutch (according to availability). Thursdays: Spanish, English, German and French (according to availability). Pick-up from Costa Teguise at 8.45am, Arrecife at 9.05am, Puerto Carmen at 9.15am, Puerto Calero at 9.40am and Playa Blanca at 9am. 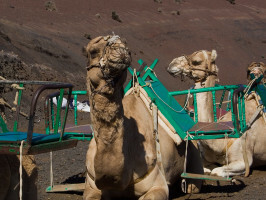 The camel ride is not included in the price and has to be paid for there and then. Start time : from 08:45 hrs approx (depending on the area/resort). End time : 16:00-17:00 hrs approx (depending on the area/resort).